You can access to the Europe maps through a button on the right panel, You will land on a page where you will be able to inspect Europe Map and Travel. 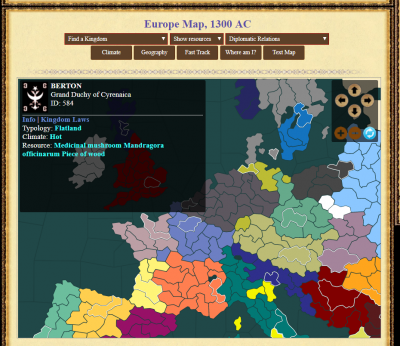 In this map you can navigate and travel around Europe. Your current position is marked with white and black stripes. To travel to a region, click on a region. Its border will become red and in the panel located on top-left you will be able to see some informations about the region and the link to travel (if appliable). If you select a Kingdom, it will be shown on the map. 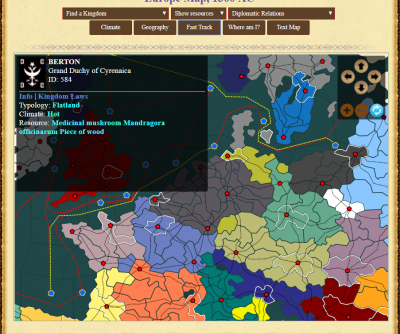 If you select a Kingdom, The Diplomatic relations of the Kingdom towards other Kingdoms will be shown on the map. If you select this option, geographical infos will be shown. If you select this option, climate infos will be shown. 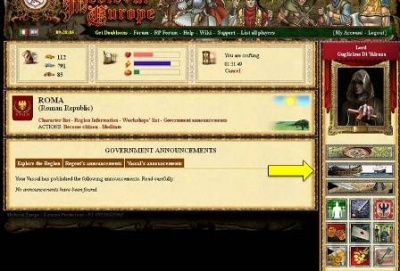 If you select this option, resources infos will be shown. If you select this option, the region where you are will be colored with black and white stripes. By clicking the Fast-Track button you will see the Fast-track network. Note: you will be able to use the Fast-track network only if you have the Traveler Bonus. This page was last modified on 8 July 2017, at 13:59. This page has been accessed 22,047 times.